Size: The Javan rhino is a smaller and lighter relative of the greater one-horned rhino. It stands at 1.4 to 1.7 metres tall at the shoulder. There is not much difference in size between the males and females, and from information gathered in Ujung Kulon and from museum skeletons, there is a possibility that females are slightly bigger. Weight: Javan rhinos are comparable in size to the African black rhino, though only a few animals have actually been weighed. They typically range between 900 and 2,300 kg. Lifespan: Javan rhinos are estimated to live an average of 35 to 40 years in the wild. Skin colour: Javan rhinos have grey or grey-brown skin, almost black when wet, with pink colouring in the folds. Teeth: Like all Asian rhinos, Javan rhinos have long, sharp, dagger-shaped lower incisor teeth. These are used in fighting and can inflict deep wounds. Javan rhinos also have two rows of 6 strong, braod and low-crowned molars on each side. The ridges of enamel on these teeth are used to cut up the woody parts of their food into characteristic 1-2cm long pieces. Over the years the teeth wear down by several centimetres to become shallow and dish-like, and making it difficult for older rhinos to break down their food. Senses: Javan rhinos have a good sense of smelling and hear very well, but are rather short sighted. Attacks on humans are not uncommon when the Javan rhino is met in the forest. Distinctive characteristics: Javan rhinos have long pointed upper lip, which assists in grasping their food. Such prehensile lips are found in all browsing rhino species: the African black rhino, and the greater one-horned and Sumatran rhinos. As for the other Asian rhinos, there are two folds in the skin circling the body behind the front legs and before the hind legs, and horizontal folds at the base of the legs. The neck folds are less massive than in the greater one-horned rhino, but two folds continue over the back of the neck, forming a characteristic “saddle” on the neck-shoulder. The skin is covered with a mosaic pattern, giving a scale-like appearance. The only remaining Javan Rhinoceros live in Ujung Kulon National Park located in Java Indonesia. Javan Rhinos are about 6 feet high (1.8 meters), 12 feet long (3.7 meters), and weigh 3,500 pounds (1587 Kilograms). 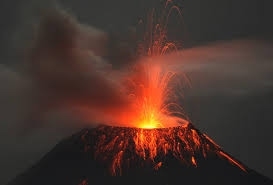 Its natural habitat is dense rainforest. The word rhinoceros comes from a combination of the Greek words for nose (rhin) and keras (horn). Javan Rhinos are generally solitary animals and have loosely defined territories. This animal is grey and has folds in its skin. The folds are less pronounced than the African rhinoceros and the Javan rhino also has a smaller head than it's African cousin. Unlike African Rhinos, who have two horns on their nose, the Javan rhino has a single horn. They have bad eyesight but have a keen sense of smell and great hearing. This animal is a herbivore with a diet consisting of plants, twigs, and fruit. Sociability: Javan rhinos are usually solitary, except for females with small calves, or during courtship. Occasionally young animals may form pairs or small groups for some time. Male territory: Males in Ujung Kulon have larger territories (12-20 km2), only marginally overlapping with other males territories. There is no indication that these territories are actually defended by territorial fights as happens in other rhino species, but they are marked along the main trails by urine, faeces, scrapes and twisted saplings. Female territory: The ranges of the females in Ujung Kulon are much smaller (3-14 km2) and overlap each other considerably. Mating and courtship: There is a short period of courtship around the time when a female is in oestrus and this is generally the only time adult males and adult female socialise. Gestation period: The gestation period is estimated to be between 16 and 19 months, however Javan rhinos have never been born in captivity so the exact length of time is unknown. 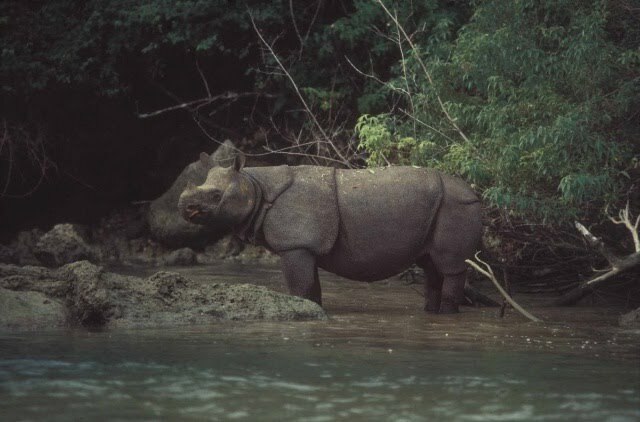 Current range: The Javan rhino exists in a single population in Ujung Kulon peninsular, western Java, Indonesia. Here the rhino population has recovered quite well from fewer than 30 individuals in 1967 to between 50 and 60 in 1980. Since then the population has been stagnant or even slowly declining. The 2015 estimate is between 61 and 63 animals. Habitat: Javan rhinos used to live in a variety of tropical landscapes, both lowland and highland, from the mangroves of the Sunderbans in India and Bangladesh, the mountains of southern China, to the sub-montane shrubs on the highest volcanoes of Java. The Javan rhino probably had a wider ecological range than either its larger relative, the greater one-horned rhino, or its compatriot, the Sumatran rhino. Diet: The Javan rhino's diet is characterized by high species diversity. Hundreds of food plant species have been recorded, but about 40% of the quantity of food eaten comes from a few preferred and common plant species. The rhinos eat mostly leaves, young shoots and twigs. Most of the plants eaten by rhinos grow in unshaded locations, in vegetation without tall trees, gaps created by fallen trees, and shrubland without trees. These unshaded places have a better average quality of food plants. Javan rhinos rarely feed in vegetation types where the quantity of available food is low. Forest: In spite of their preference for feeding in vegetation types without tall trees, Javan rhinos are probably dependent upon the occurrence of forest in their environment. Forest provides protection against solar radiation, water supply is subject to smaller fluctuations inside forest than outside, and forest trees are the source of many saplings eaten by rhinos. The optimal habitat of the Javan rhino, with regard to vegetation types, therefore appears to be a mosaic of glades interspersed with patches of forest. This kind of habitat is widely distributed in Ujung Kulon. Mud wallows: Javan rhinos spend up a large part of the day wallowing in mud holes. They may use temporary pools and puddles, which they deepen with the feet and horn. The access to mud wallows is essential for thermo-regulation, skin condition and to get rid of ectoparasites (parasites that live on the surface of their host) and biting insects. Small population size: The biggest threat to the Javan rhino is the very small size of the remaining populations. This leads to inbreeding and loss of genetic variability and vitality. The two habitats where Javan rhinos occur are secure, but much too small for long-term survival of the species. Poaching: Javan rhinos are poached for their horn, which is used in Asia as a medicine against fever and pain. A Javan rhino in Vietnam was found poached with its horns removed in April 2010. Later DNA research on dung samples indicated that this was the last rhino remaining in that population. Habitat loss: Apart from poaching, habitat destruction and loss for agriculture and development are further threats to the rhino populations. Though officially all rhino habitats are strictly protected by legislation, in practice many areas are subject to large-scale encroachment by poor and landless communities, and the park management usually does not have the means and the political support to counter this pillage. Habitat is still not a limiting factor overall, but neither of the two remaining habitats are large enough to allow significant growth of the rhino population, now or in the future. Re-establishment of Javan rhinos in areas where they have been exterminated and rejuvenation of their habitat in these areas are vital components of the conservation strategy for this species. Vietnam: The Javan rhino was confirmed extinct from the Cat Loc part of the Cat Tien National Park, Vietnam in October 2011. The last few Javan rhinos in Vietnam were very small, no more than 1.2 metres at the shoulder, and probably of similar weight to a Sumatran rhino, less than 800 kg. Population decline: The Javan rhino showed the most dramatic decline of all three Asian rhino species, and by about 1930 the Javan rhinos was restricted to Ujung Kulon, a small peninsula on the westernmost tip of Java and a few small isolated populations in Vietnam and possible Laos and Cambodia. It’s a mystery: By the time the first naturalists ventured into the Southeast Asian forests, the Javan rhino was already very rare, and not much is known about its behaviour and ecology outside the single remaining viable population, which may not even be located in ideal or typical habitat. Future possibilities: With continued strict protection, both of the remaining rhinos and their habitat, and with active translocation and establishment of new populations in suitable and secure habitats, over the next 150 years the populations ought eventually to be able to recover to at least 2,000-2,500 individuals; the number determined by population biologists as a minimum requirement for long-term survival of the species. Digestion: All rhinos are hind-gut fermenters (they use micro organisms in the last part of the intestine to break down indigestible parts of the food) and have a large cavernous caecum and colon. Zoos: Very few Javan rhinos have ever been exhibited in zoos, and the last one died in Adelaide Zoo, Australia, in 1907. During its life it was exhibited as a greater one-horned rhino!